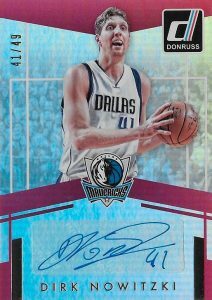 Seemingly a rarity in today's premium-driven hobby, Panini's 2016-17 Donruss Basketball falls more on the simple side of the collecting world. Each hobby box promises a pair of hits in the form of one autograph and one relic. 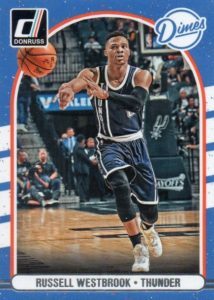 Built around a comprehensive checklist, the base set includes 50 rookie players from the 2016 NBA Draft. 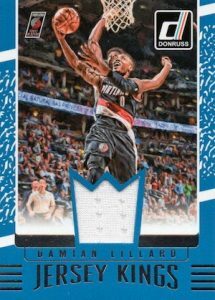 Perhaps not thought of as much for the hits, 2016-17 Donruss Basketball still offers several options for collectors. 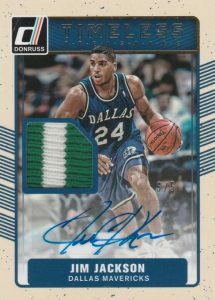 Elite Signatures totals 100 cards that are all limited to 99 copies or less with Green (#/5) and Black (1/1) parallels. 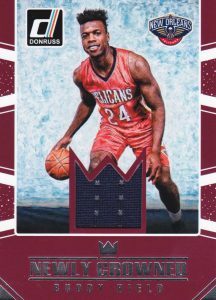 Dominator Signatures applies an autograph to the familiar insert line while Hall Dominator Signatures works with 30 Hall of Fame players such as Oscar Robertson, Hakeem Olajuwon and David Robinson. Delving into the rookie class are signed inserts like Next Day Signatures which are so named because they are photographed, printed and signed (on-card), all in a 24-hour period during the Rookie Photo Shoot. Also, Rookie Materials Signatures comes in a base autographed relic edition (#/75) and a Prime parallel (#/10). 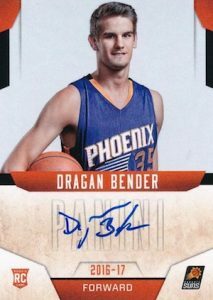 Like the autographs, the 2016-17 Donruss Basketball memorabilia inserts drop one per hobby box. 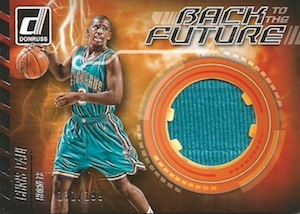 Among the choices are Back to the Future relics that showcase players on their former teams. 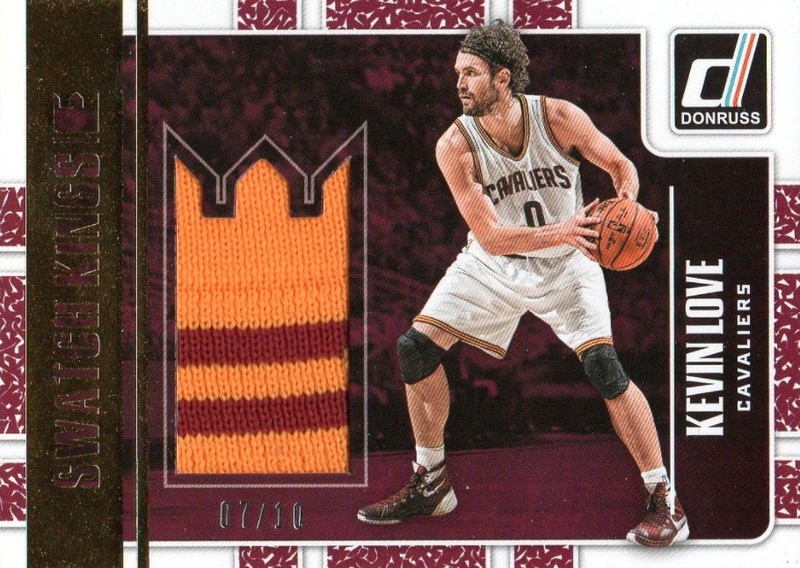 Giving more options to set collectors are the inserts that fall one per pack. 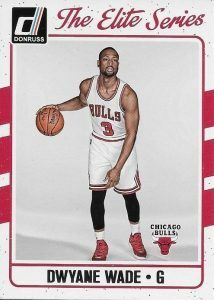 In addition, limited Optic Preview inserts foreshadow another release on the horizon and make use of Opti-Chrome technology for the 100-card set. HOLO LASER PARALLEL CARDS: Green & Yellow, Green #/99, Red #/99, Blue #/49, Yellow #/25, Red & Blue #/15, Purple #/15. PRESS PROOF PARALLEL CARDS: Silver #/299, Purple #/199, Red #/75, Blue #/25, Gold #/10, Black 1/1. PARALLEL CARDS: Press Proof, Press Proof Blue #/99, Press Proof Black 1/1. PARALLEL CARDS: Prime #/10 (*Card #4 - #/3). PARALLEL CARDS: Press Proof, Press Proof Orange #/125, Press Proof Blue #/99, Press Proof Black 1/1. PARALLEL CARDS: Green #/5, Black 1/1. 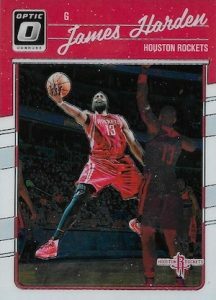 PARALLEL CARDS: Prime #/10 (*Cards #17 - #/3, 19 - #/8, 25 - #/7). 34 cards. Serial Numbered #/75. PARALLEL CARDS: Prime #/10 (*No card #/9; cards #1, 11 - #/6, 19 - #/7). PARALLEL CARDS PRIME: Cards #1-11 - #/25; Cards #12-25 - #/5. Not a big fan of the brown boarders, but overall, good cards for the price. I was a little disappointed that I only pulled one auto and no memorabilia cards despite the claim to receive one of each on average. Product appearance is so-so. I could live with it if it were not for the extremely high number of damaged cards per box. 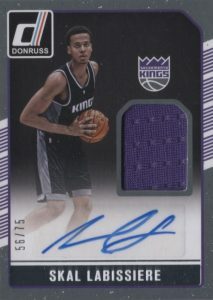 I bought a hobby case (20 boxes). The first box had 62 of the 288 cards damaged. Way too many. 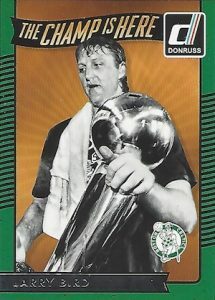 I had hoped they would do something more with my Cleveland Cavs winning the title last year, but the “The Champ Is Here” card for LeBron is from a Heat title. At least there is a Kyrie Irving one for last year. 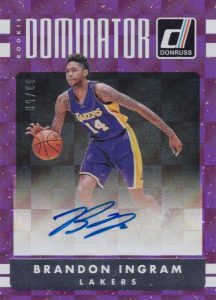 My memorabilia card was Andrew Wiggins, so I was pleased with that. The auto was a rookie I’ve never heard of. I did manage to get a complete set and some doubles from just one box, which is good. One of my doubles was a Kyrie =). 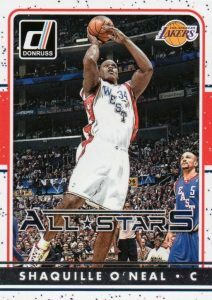 It feels weird to not see a regular Kobe card. Kobe and LeBron were always the top 2 cards for the last decade. 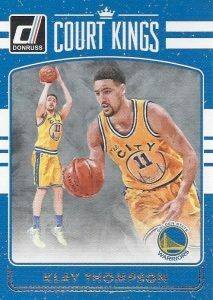 I only had one damaged card, but it was Klay Thompson. So I need to buy that to complete the set. 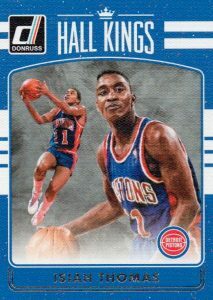 I’ve always liked Donruss. It was sort of the middle brand for me when there was only Topps/Donruss/Fleer in the 80’s. Bought 2 boxes for $60 each last Wednesday. Got 2 full complete sets plus a Jamal Mashburn Auto #/5, Thon Maker Next Day Signatures, Lebron James Relic, Chris Paul Press Proof Gold #/10, Stephen Curry Holo Laser Red #/99, and Press Proof cards of Lebron James and Kevin Durant #/299. Very happy with this product and the cards I pulled. If everyone who bought a box had just waited a couple weeks after release they would have paid almost half of what they did. 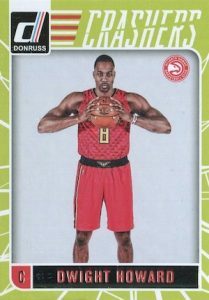 It’s a trend with almost all Panini releases. Nick, best advice ever! Thank you. 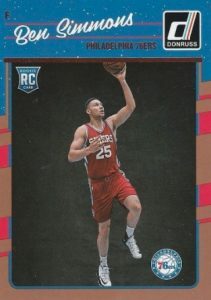 Collecting this product provides some fair value and opportunities to obtain first round draft rookies and NBA basketball veteran relics, not to exclude the occasional autograph. I love the cards, but we got screwed over. In 4 of our packs we received thick pieces of blank cardboard instead of cards. So what should have been the thicker, fancier cards turned out to be blank worthless pieces of cardboard. These are decoys used to confuse pack searchers. They should not replace any autographs or relics.